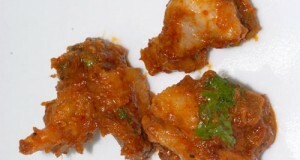 Learn how to make Kolhapuri Fish recipe using our easy to make homemade Kolhapuri Fish recipes. 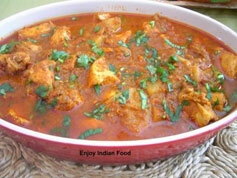 Try this homemade Kolhapuri Fish cooking recipe at your home. 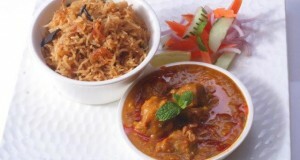 Mix turmeric, chilli powder, garlic paste, salt and lemon juice into the yoghurt and marinate fish in it for 10 minutes. Heat oil, add bay leaf, cinnamon, cloves, black pepper and onions. Saute till onions are soft. Add coconut and saute till a light brown. Add tomatoes and cook till access water dries. Blend the whole mixture in a blender. Heat the rest of the oil and add the fish. Stir fry over high heat till opaque. Add the ground paste and simmer over low heat till fish is cooked through. 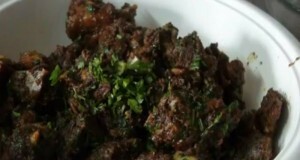 Garnish with coriander leaves and serve.